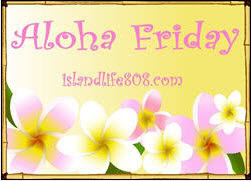 I can't believe I missed a couple of Aloha Friday's after going strong for several months. But, I've found lately that I just don't have as much time for blogging as I'd like. At least Hubbie is home from Haiti now, so I'll have a little help around here :) We missed him tons, and we're thankful he returned home to us safely. My question for the week is: Have you ever used an all natural or organic hair colorant? After reading an article in Kiwi Magazine about the carcinogens in hair dye, especially the darker colors, I have been reluctant to color my hair during this pregnancy, even though I'm in the 2nd trimester now. Still, my grays are driving me nuts and I'd love to give them the boot! Nope, well I don't think so. I go to a salon. No, I need to ask my salon about this! I did once and the colour cost $400 to correct in a salon. However, that was back in '92. Nope. I don't color my hair. I hope you find a good solution. I have not colored my hair in years, but when I did, it was always the L'oreal box. I don't think that was organic..lol. Actually, I don't even think they made organic back then. I have not, only the stuff my hair dress puts in my hair and my guess is it isn't all natural or organic. I must say, I am do to get rid of those grays myself. Happy Friday! I usually go to a salon so I've never tried the organic hair stuff. Sorry to leave this in your comments, but I couldn't find any other way to contact you. FREE BABY MAGAZINE'S TOP BLOGGER 2010 CONTEST!! -The Top Ten Blogs in each category will be featured in the magazine. Hi. My Mom used one and said it was much gentler on her hair and the color seemed to last longer in my opinion. Warning : I would not say though that it turned out exactly as the box said it would..much darker.. and perhaps that was because of the natural Henna in it..? But she loved it and the color was a beautiful Amber.. I thought about using it when I was pregnant but decided not to. Isn't it kind of expensive? Yes I recently used a Clairol Natural one. At first I was skeptical, but I really liked it. I think I'll use it again. The color was great and it did not smell at all. ho I haven't!Glad your hubby's home!